The second edition of the HydroSenSoft Symposium took place from February 26th to March 1st of 2019 in Madrid. This International Symposium and Exhibition on Hydro-Environment Sensors and Software, organized by Experimental Methods and Instrumentation Committee (EMI) of IAHR, took place at IFEMA alongside several other exhibitions relevant to the water industry, like SIGA-Trade Fair for Innovative Water Management Solutions. A special session on drones and a national session were offered during this symposium, organized by IAHR. 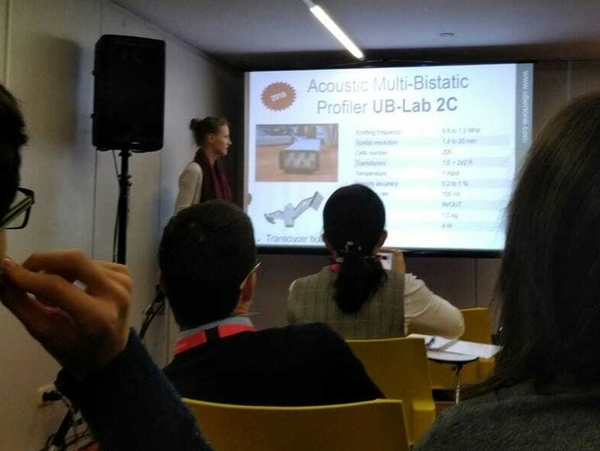 Ubertone presented a benchmark measurement campaign carried out at the LEGI in Grenoble, France, comparing our new product, the UB-Lab 2C, which is an ADVP (Acoustic Doppler Velocity Profiler), with the ACVP (Acoustic Concentration and Velocity Profiler) developed by the LEGI, with the article “Turbulence And Sediment Transport Measurements With A New Two Components Ultrasonic Profiler” by H. Guta, S. Fischer, D. Dufour, M. Burckbuchler and G. Fromant. These tests validated the ADVP prototype, called UB-MES in the M.E.S.U.R.E. project. In this paper, new data set of co-located 2C velocity and sediment concentration time-resolved measurements under steady uniform turbulent rough clear water and sheet-flow, performed with an Acoustic Concentration and Velocity Profiler (ACVP) and a prototype for a commercial ADVP, the UB-Lab 2C, are presented. The flow regime for the measurement with both devices was similar. Comparisons of mean profiles of fluid velocity, Reynolds shear stress and turbulence intensities showed good agreements, with a mean relative error below 10% in clear water flow conditions. Time-resolved turbulence measurements also displayed a good agreement between the systems. The quadrant threshold distribution showed that both ejections and sweeps are the dominant turbulent bursting events in clear water uniform rough flow. Good agreement was also observed in sheet-flow measurements from ACVP and UB-Lab 2C. Comparisons of mean velocity profiles, sediment concentration and sediment flux under sheet-flow, revealed relative differences below 20%. The quadrant analysis showed different dynamics from clear water flow. Sweeps seem to be the dominant events particularly in the near-bed region, followed by outward interactions. However, in the upper region of the flow, ejections and sweeps become the two dominant turbulent bursting events, as in clear water flow. The conformity with results from previous studies performed in similar flows conditions supports the good performance of the UB-Lab 2C for turbulence measurements and sediment flux profiling.